On a Tuesday afternoon, Julian Johnson sat in a classroom in TEAM Englewood Community Academy with the rest of his slam poetry team. Although he’s a junior at TEAM Englewood, Johnson is new to the team. He had seen upperclassmen perform spoken word and written some poetry here and there, but joining the team was a big step. Melissa Hughes, the coach of TEAM Englewood’s team, noted this as she confirmed his plans to attend South Side Slam, an annual competition for high school poets on the South Side. The following Saturday, Johnson joined students from twelve high schools across the South Side at TEAM Englewood Academy for the South Side Slam. 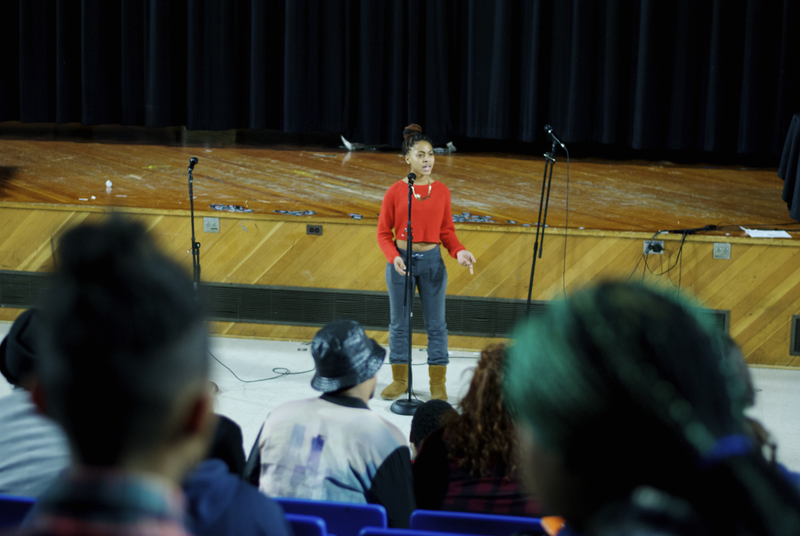 The sixth annual Slam was an opportunity for teen poets to share their work with a live audience in anticipation of Louder Than A Bomb (LTAB), the annual Chicago-wide poetry competition for high school students. Hughes, an English teacher at TEAM Englewood, and Molly Myers, who teaches at Lindblom Math and Science Academy, co-organized the event. Young Chicago Authors, the spoken word nonprofit that hosts LTAB, provided staff and connected new coaches to Hughes and Myers. Hughes intended the South Side Slam to be a place where students could share their stories, and where the audience could listen and learn. The poems covered a variety of topics—from gentrification to cultural appropriation to experiences with abuse. Marquis “Picasso” Eason, a junior at Percy L. Julian High School, had to pause for a moment while performing a piece on his experiences with bullying. In response, the audience snapped and clapped in encouragement. Eason is the captain of Julian’s poetry team. He was first drawn to poetry when he saw a performance on TV at three years old. Eason was shy when he joined the team as a freshman, but with his coach’s encouragement he eventually opened up. He said he chose the stage name Picasso because his coach, noting Eason’s talent for painting, told him he was an imagery poet. Patricia Frazier, the captain of the poetry team from Gwendolyn Brooks College Preparatory Academy, performed a group piece about cultural appropriation, as well as an individual piece about how gentrification has impacted her life. Frazier grew up in the Ida B. Wells Homes in Bronzeville before they were demolished and still returns to the neighborhood to visit her grandmother. As the South Side Slam came to a close, all twelve teams gathered in the TEAM Englewood auditorium to watch the final round. The three teams still in competition gathered at the auditorium floor for the final score tally. Third place went to Julian High School, second place to Merrillville High School (from Merrillville, Indiana), and first place to Kenwood Academy. Miller says his team will be celebrating a little, but not for long. As for Johnson, he said his debut with TEAM Englewood’s team was more than encouraging.